In the U.K the Syfy channel has always been a channel to go against the grain. The channel has always seen the potential to screen programmes that appeal to a niche market, they have now acquired some key manga films to be screened on the UK network. Every Saturday Syfy will be screening a major manga title starting with this Saturday being Akira. January 7 -Akira @ 11.10 pm. Neo-Tokyo, 2019. The city is being rebuilt post World War III when two high school drop outs, Kaneda and Tetsuo stumble across a secret government project to develop a new weapon - telekinetic humans. After Tetsuo is captured by the military and experimented on, he gains psychic abilities and learns about the existence of the project's most powerful subject, Akira. Dangerous and destructive, Kaneda must take it upon himself to stop both Tetsuo and Akira before things get out of control and the city is destroyed once again. January 14 - Ninja Scroll @ 11.10 pm. A ninja-for-hire is forced into fighting an old nemesis who is bent on overthrowing the Japanese government. His nemesis is also the leader of a group of demons each with superhuman powers. January 21 - The Girl Who Leapt Through Time @ 11.10 pm. What would you do if you could “leap” backward through time? When tomboyish 17 year old Makoto Konno gains this ability after an accident in her high school chemistry lab, she immediately sets about improving her grades and preventing personal mishaps. Before long, however, she realizes that even innocuous changes can have terrible consequences. Changing the past is not as simple as it seems, and eventually Makoto will have to rely on her new powers to shape the future for herself and her friends. January 28 - Redline @ 11.10 pm. The most dangerous and exciting car race in the universe is held only once every five years. And that’s tonight. The competitors are lined up at the starting block. In his vehicle, JP, the most daredevil driver on the circuit, is ready for the green light. Female driver Sonoshee, with whom he is secretly in love, is also on the starting line. She will stop at nothing to get on to that podium. In this race, not only is anything possible, but also anything is allowed. February 4 - Summer Wars @ 11.10 pm. When timid eleventh-grader and math genius Kenji Koiso is asked by older student and secret crush Natsuki to come with her to her family’s Nagano home for a summer job, he agrees without hesitation. Natsuki’s family, the Jinnouchi clan, dates back to the Muromachi era, and they’ve all come together to celebrate the 90th birthday of the spunky matriarch of the family, Sakae. That’s when Kenji discovers his “summer job” is to pretend to be Natsuki’s fiancé and dance with her at the birthday celebration. As Kenji attempts to keep up with Natsuki’s act around her family, he receives a strange math problem on his cell phone which, being a math genius, he can’t resist solving. As it turns out, the solution to the mysterious equation causes a hijacking of the social networking site through which most of the world's social and business traffic flows. It’s up to Kenji and his new fake family to put reality back in order. Hana is a 19-year-old student who falls in a "fairy-tale like" love with a "wolf man". Over the course of the 13-year story Hana gives birth to two children - older sister Yuki, and younger brother Ame, or "Snow and Rain". At first the family quietly lives in the city trying to hide their wolf heritage, but when the "wolf man" suddenly dies Hana makes the decision to move to a rural town, far from their previous city life. So as we always say, keep anime alive in the UK and get on your TV or set your sky/virgin planners to record these amazing movies. Today marks another landmark for Manga Entertainment / Animatsu as Attack On Titan comes to UK cinemas with a bang! AOT is playing at select cinemas up and down the UK. Check the website Attack On Titan to book tickets and also check what cinemas near you have the film playing. We need to support Manga / Animatsu for screening these films in the cinema, it takes a lot of time and effort to allow this to happen so let's show that we want more by purchasing a ticket*. * Some cinemas are playing parts 1 and 2 back to back. We have just recieved the press release of the new Dragon Ball Z film heading to a cinema on 30th September 2015. It is so amazing to see manga entertainment keeping our dragon ball fans excited and showing them love by screening this on the big screen. 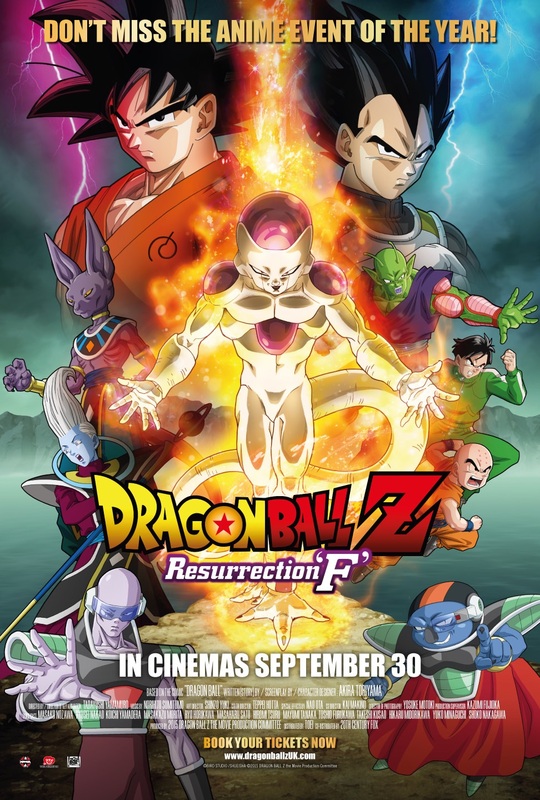 "Manga Entertainment are delighted to announce the theatrical release of Dragon Ball Z: Resurrection ‘F’, in cinemas on 30th September in the UK and Ireland. This hugely exciting follow up to Dragon Ball Z: Battle of Gods will allow fans to watch everyone’s favourite anime spectacular on the big screen. 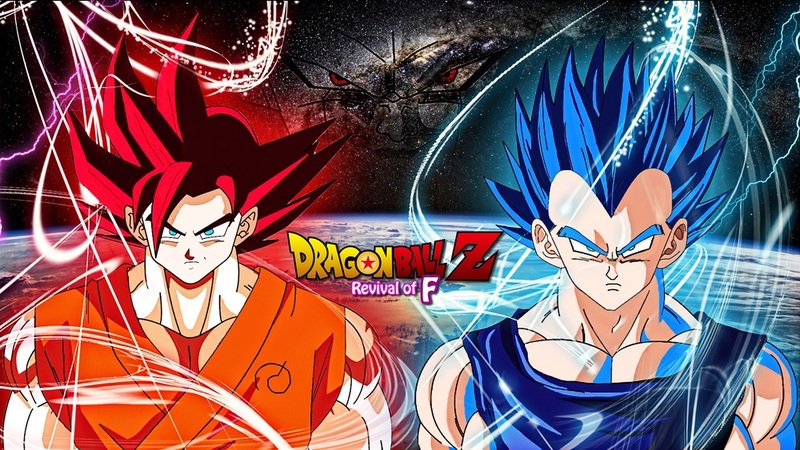 Dragon Ball Z: Resurrection ‘F’ is the second film to be personally supervised by the creator of the series, Akira Toriyama, and promises to feed the appetite of DBZ fans that are hungry for more. The movie features the return of Frieza – widely hailed as one of the most iconic villains of all time. Even the complete obliteration of his physical form can’t stop the galaxy’s most evil overlord. After years in spiritual purgatory, Frieza has been resurrected and plans to take his revenge on the Z-Fighters of Earth. Facing off against Frieza’s powerful new form and his army of 1,000 soldiers are Goku and Vegeta who must reach new levels of strength in order to protect Earth from their vengeful nemesis." The film will be shown in selected cinemas across the UK and Ireland for exclusive screenings only. At Showcase and Empire Cinemas, each ticket purchased will receive a free limited edition figurine (subject to availability). This is an absolute must for any anime / dragon ball Z fan, we need to keep support this film coming to the big screen as this is a chance to show everyone that anime is just as big as your conventional Disney animation. To book your tickets and check for participating cinemas visit www.dragonballzuk.com. This Dragon Ball Z film is not just good, it is great and you will not be disappointed! Finally Dragon Ball Z: Resurrection F is out in 90+ cinemas!! Manga Entertainment has managed to do it and increase the number of cinemas that have this film on show and we are so excited! Please support and book your ticket now as this is the biggest revival of Dragon Ball Z we have ever seen! !